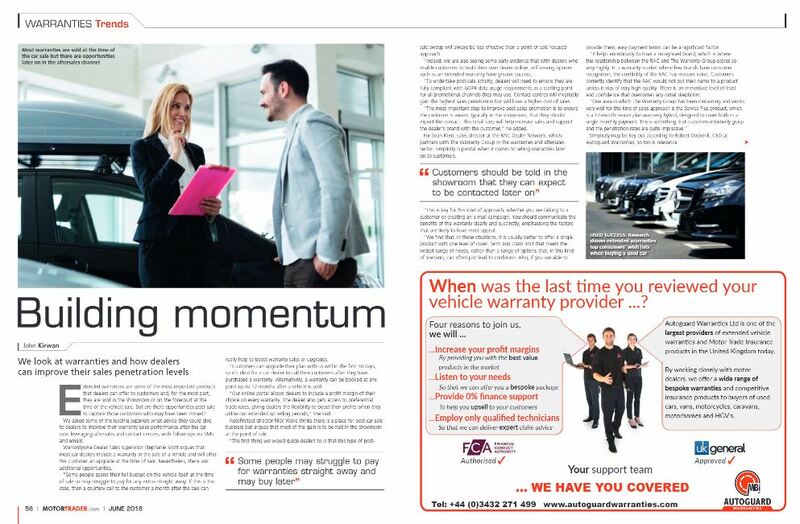 What advice can you give dealers to improve their warranty sales performance after the car sale in aftersales, contact centres, SMS and emails? The first thing we would guide dealers to is that this type of post-sale ‘sweep’ will always be less effective than a point-of-sale focused approach. Indeed, we are also seeing some early evidence that with dealers who enable customers to build their own dealer online, self-serving options such as an extended warranty have greater success. To undertake post-sale activity, dealers will need to ensure they are fully compliant with GDPR data usage requirements as a starting point for all promotional channels they may use. Contact centres will invariably gain the highest sales penetration but will have a higher cost of sales. The most important step to improve post-sales promotion is to ensure the customer is aware, typically in the showroom, that they should expect the contact. This small step will help increase sales and support the dealer’s brand with the customer. Can you highlight any key trends or developments in the warranty sector or any new products or services you have planned? The key trend is towards quality. Comprehensive and transparent warranty products written in plain-English are what customers want.